How to put the dimension on the out side radius without extending the dimension line till centre? It's much easier and quicker if you just make a note with a leader and type in the dimension text. 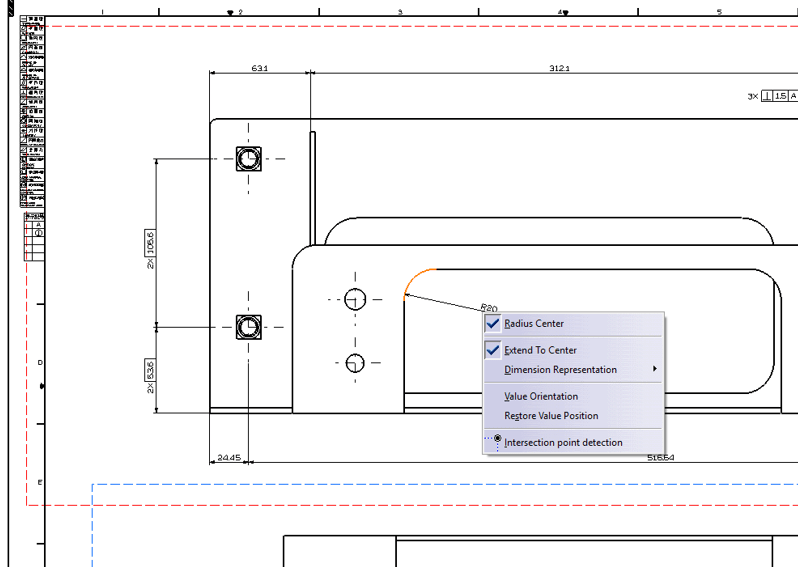 look at modifying or creating a new drafting standard. Set this setting to "NO"
Typed-in dimensions are THE WORST drawing habit to cultivate... I'd never instruct anyone to do that, ever. You are absolutely correct JQKRI. And I agree with you when the dimension is on larger, shape-defining curves. It is my experience that the extended leader lines are unwanted on the smaller dimensions where the size really isn't that important. Like the radii on retaining ring grooves, or reliefs on sheetmetal bends, or the bend radii that called out as MAX, etc. In these situations, it is much easier and quicker to just make a leader note, instead of a dimension. But it is a bad habit. Thanks for pointing that out. Thanks for your reply to this post. Is that because administration restrains?